After my disastrous first attempt at my seeded sourdough, pride forced me into another go at it. This batch turned out pretty well actually. 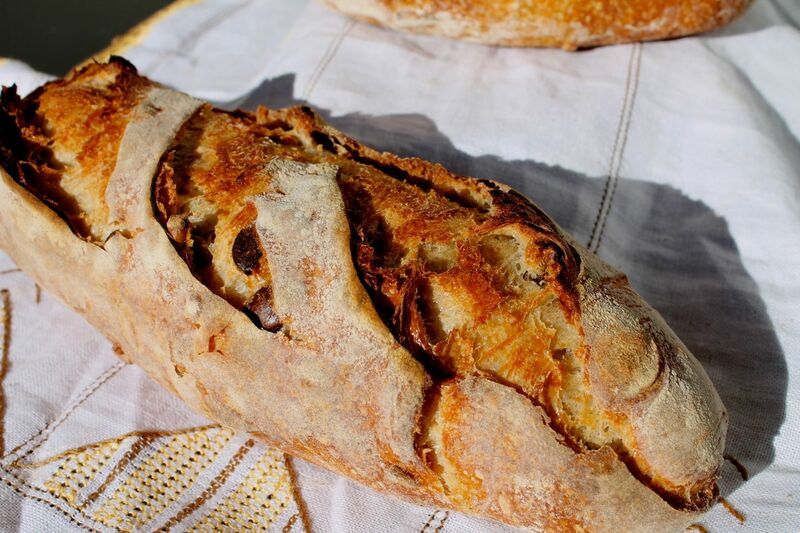 I split the dough into a baton and a bâtard. I baked the baton first and I don't think it was quite proofed since it still blew out it's slashes and the crumb was tighter than I expected, though that was partially due to my crappy shaping ability. The bâtard on the other hand, turned out lovely. No crumb shot (um, that's what she said?) because I'm giving it to a friend. I will definitely try this again, maybe with a higher hydration and a longer retard next time. And you know, less crappy shaping. The baton was delicious. My wife and I shared it for lunch with some camembert, prosciutto and arugula. Nice, soft, slightly chewy crumb, with a thin, crackly crust. 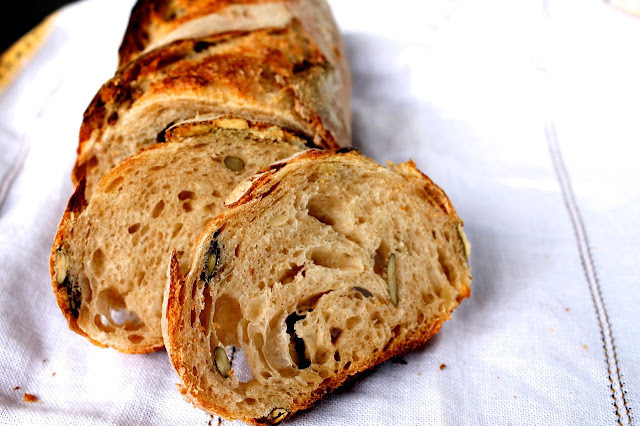 The pumpkin seeds combined with the sourdough and a bit of whole wheat flavor from the starter go great together. Tastes like fall. Mix the starter, flour and 255 grams of the water (holding back 20g for later) until you get a shaggy mass. Autolyse (a fancy word for "Oh crap I forgot to put salt in! I guess I'll put it in later. Oh wait.. you mean that makes my bread better? Sweet!") for about 2 hours. After 2 hours add the salt, seeds and 20 grams of left over water. Stretch and fold the dough (Just like it sounds. Pick it up, strech it out, trying not to break it, and fold it over itself 3 or 4 times) every 30 minutes for about two hours until the dough has grown by about a third. Put it smooth side down in a lightly oiled bowl, cover and put in the fridge for 12 hours-ish, or overnight. Take the dough out and divide it if you want. I made a small baguette and small batard out of it, but you could make one good sized boule too. Left it rest for 30 min or so then shape into desired loaf or loaves. Let proof for another 1-2 hours. The total rising/proofing time depends a lot on the temperature of the room so use the "poke test" (more on that later too) and make sure it's a bit jiggly. Preheat the oven with a cast iron pot or a roasting pan covering a cookie sheet or baking stone, or some other way of steaming. Slash your loaves and load them in the oven. I did this with a parchment paper sling, but you could use a pizza peel if you are using a stone. Bake with steam for 20 min, then 20 more uncovered. Internal temp should be about 205-210F. When it's done, turn the oven off and leave the bread in the oven with the door propped for another 15 minutes. This will help keep the crust crunchy. Wait until the bread is fully cooled before you cut it (I won't judge you if you can't). Enjoy with a loved one. 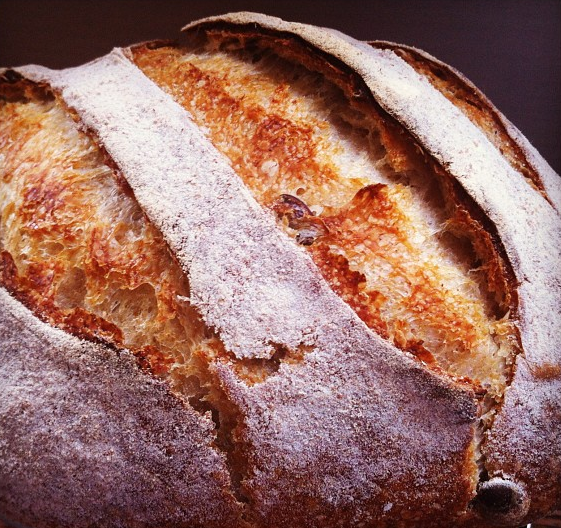 I'm submitting this post to Yeastspotting, a great weekly list of bread blog entries on Susan Tenny's site, Wild Yeast. This is absolutely gorgeous! I love that first shot and want to sit down with that loaf until there's nothing left! Ryan, this looks delicious and beautiful. I would love to join you and your wife for lunch and have this bread, even without the camembert, prosciutto and arugula.